As the 116th Congress commences, in the wake of dire reports from climate scientists, the debate over U.S. climate policies has taken a welcome turn towards bold solutions. Spurred on by grassroots pressure from Indigenous communities, the youth-led Sunrise Movement, and communities from coast to coast fighting fossil fuel infrastructure, Capitol Hill is alive once again with policy proposals that edge towards the scale required to address the crisis we’re in. Previous analysis of the global disconnect between fossil fuel industry plans and climate goals underlies our U.S. report. 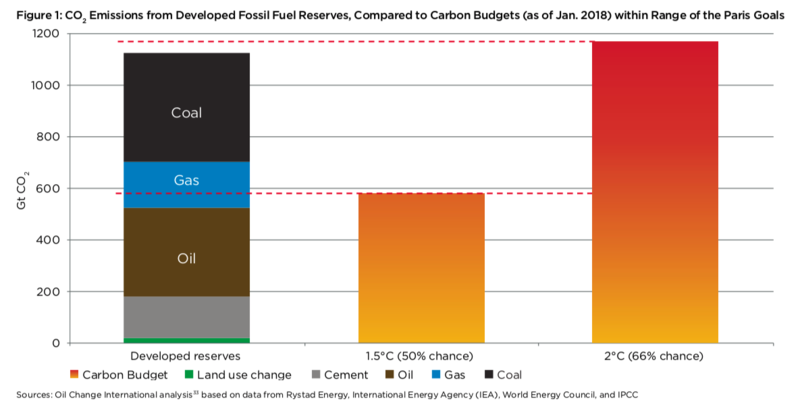 Existing oil and gas fields and coal mines around the world already contain enough carbon to push the world beyond the goals of the Paris Agreement – and well beyond 1.5 degrees Celsius (°C) of temperature rise (Figure 1). There is already no room for new fossil fuel development anywhere in the world. Meeting the Paris Agreement goals requires stopping new exploration and extraction projects and managing the decline of the fossil fuel industry over the next few decades. 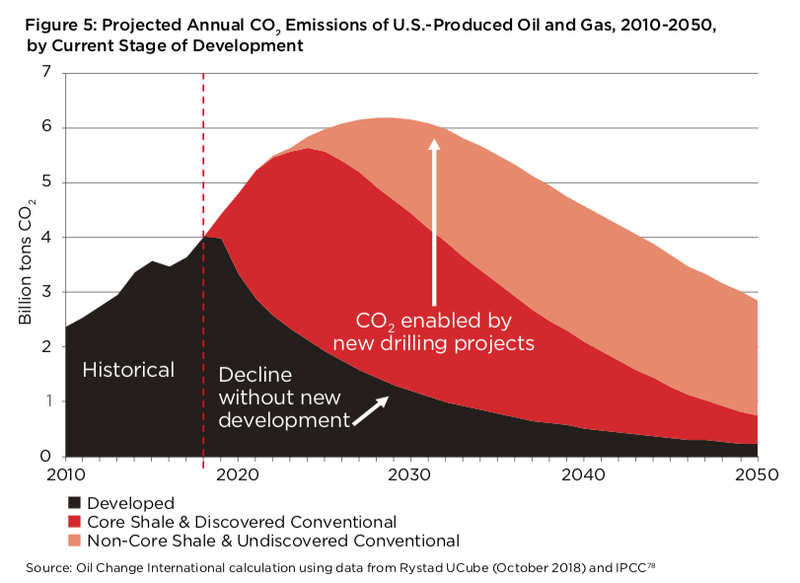 To summarize: At precisely the time when the world must rapidly decarbonize to avoid climate disaster, the United States is moving further and faster than any other country to expand oil and gas extraction. 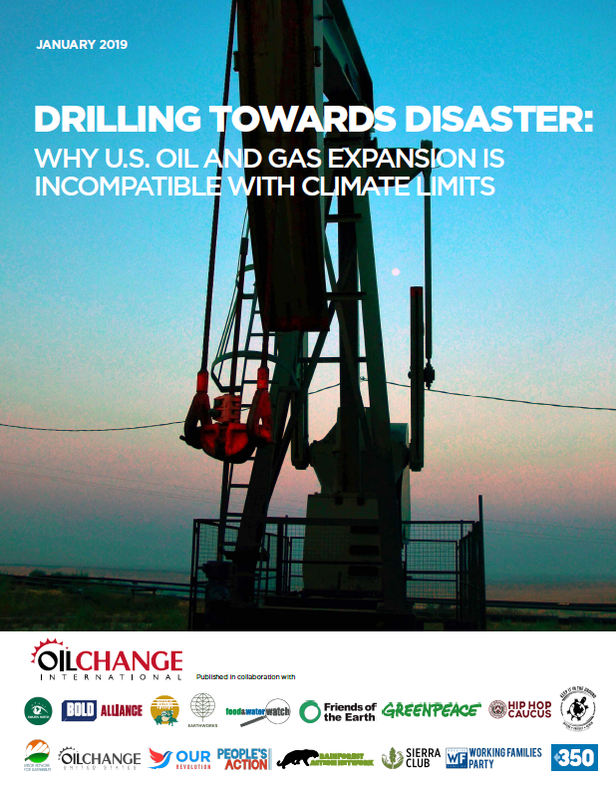 Upwards of 90 percent of the projected drilling expansion analyzed in our report would depend on fracking. This would bring with it more air and water pollution, health risks, heavy trucks taking over roadways, and growing competition for water. It would mean more dangerous pipelines threatening the sovereign land and water sources of Indigenous peoples. 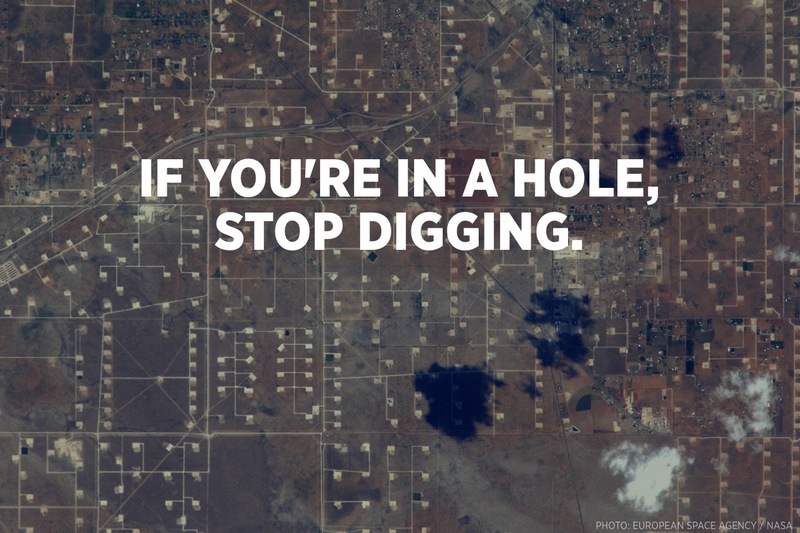 It would mean more communities being entangled in a volatile industry that has no viable future on a livable planet. Glad you are working on emissions from fracking, and especially the under-reported methane leaks. Your message to policymakers to keep it in the ground is very important! So great job. However, as a researcher who follows oil and debt issues (at UNC-Chapel Hill) I wonder if your decision to rely on Rystad Energy projections (based on oil-gas industry data) is not overly optimistic — offering an unlikely scenario of future oil-gas production -esp. given such a long timeline as 2050. David Hughes’ reports — eg. 2016 Tight Oil Reality Check — criticize the optimistic fracked gas/oil projections of the EIA and he specifically discusses flattening production curves in Permian Basin in the last one. In the last 18 months reports in Financial Times, Forbes and even EIA have argued that the Permian is likely to peak in early 20s. The debt picture, further complicates future projections, as few fracking companies are making profits at present, and recent weakening of oil prices globally (once again) suggest a great deal of fragility in return on investment. Many companies have gone bankrupt, which has complicated financing, and there are serious limits on available rigs, etc. that constrain production. Remember that tight oil production has underwritten gas production to date, and there are much lower reserves for oil than for gas, and the wells producing oil are being tapped first, with high rates of exhaustion for individual wells. In terms of your editorial decisions on framing the study, I would have argued for a shorter timeline, (like 2035) and a more nuanced and critical discussion of the industry’s (always rosy) projections – which are aimed at bankers and policymakers. I know many folks working on activism around pipelines in US southeast, including NC WARN, and one of their arguments against the pipelines, based on critical analysis of fracking industry claims, is that given these Energy Return On Investment questions, there will not be sufficient gas to fill the pipelines, and therefore the economic investment of utilities building them is also questionable. Sandy, thanks for checking out the report, and for your feedback. Your comments hit on important questions. There is short-term volatility in oil and gas markets. However, U.S. production is in the midst of unprecedented growth, despite skepticism from many sources about the potential of fracking. (David Hughes has done some excellent work and certainly got the situation with the Monterey shale in California right.) For the industry as a whole, many of the projections made 5 to 10 years ago have been surpassed, as drillers have tweaked their technology and methods. 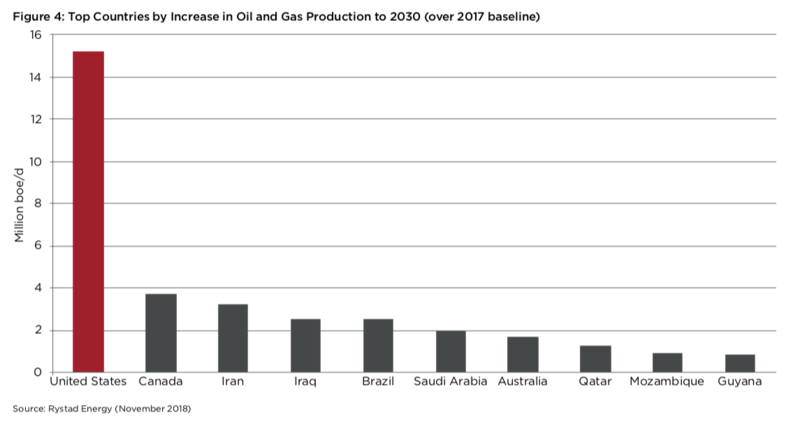 New oil and gas development anywhere in the world is incompatible with meeting the Paris Agreement, and yet the U.S. is expanding oil and gas production more rapidly than any other country. Our purpose in writing this report was to expose the consequences to the climate if this is allowed to continue. We do not suggest that it inevitably will continue, but point towards the political leadership needed to *ensure* it does not. With any projection, there is uncertainty. Final volumes of production could end up being higher or lower. Rystad Energy is an independent company – they don’t rely only on oil and gas industry data and do their own analysis and economic modeling as well. We’ve discussed their Permian forecast in particular in detail with their analyst who focuses on it, and they have done a lot of independent analysis of the factors influencing production in the basin. (Rystad’s forecasts have typically been more reliable than EIA’s, and do not share the same political motivations as either EIA or the oil companies.) It’s also important to recognize that the industry has secured for itself numerous tax breaks and benefits to keep it going in the face of market swings. The projections in our report are based on Rystad’s estimation of what’s commercially viable under a base price case, not the full potential of available oil and gas resources. And, if this is what is possible – and what the industry is planning for – then we urgently need political leaders to be treating it as the serious threat to our climate that it is! In our view, we should not count on markets to sort this out, even if there is, as you note, volatility and risk in the industry. Kelly Trout, I am working in a related industry for over 25 years (heating systems for buildings). I have master’s degree in engineering and science. In our enterprise we’ve been using the most advanced energy efficient, sustainable technology wherever it is economically viable. I’ve been watching the environmental / climate change issues very closely all my professional carrier (as the indoor climate is derived from and depends on numerous aspects of the outdoor climate). My conclusion, and now certainty, is that the climate alarmism is beneficial only for obtaining universities’ research grants and for justifying activist’s existence. It is a new religion which can’t be debated in public, new Dark Age of the Western Civilization. It is harmful to the human environment, economy and Nature. The only reason the alarmism has some media traction is that THE BAD NEWS SELS. Think about the next generation. THAT’S WHY AS I ALWAYS SAY AND WILL, THE SOONER WE ALL DO OUR PART TO FIGHT CLIMATE CHANGE AND PROTECTING PLANET EARTH IN EVERY WAY, THE ALMOST REASSURANCE THAT PLANET EARTH WILL BE PRISTINE AND THEREFORE AROUND FOR INDEFINITELY!! !